Not so long ago, computer-savvy parents worried most about what their children were looking at on the Web, hoping that they would not accidentally stumble across an inappropriate website or get involved in online chats with adults posing as children. With the advent of parental controls that block inappropriate websites, these days more parents are more concerned with how much time their children spend on computers. In particular, many have become worried that some of their little charges may have become addicted to the Internet. Children who spend too much time on the computer time can exhibit a lot of negative behaviour, from engaging in sibling arguments about who gets to use the computer first, to becoming argumentative, sullen, moody and withdrawn when their time is up. Perhaps most importantly, many parents say, too much computer time means less time a child is spending reading a book, playing in the fresh air, or indulging in imaginative games with friends. 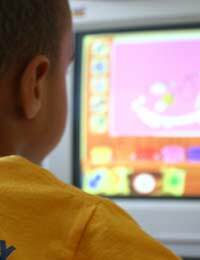 Children as young as age two play independently on computers these days, and most primary schools encourage children to become computer-literate from reception age on. Homework is often computer-based, and Facebook, Twitter and YouTube have become a part of everyday life for many secondary school age children. In one widely reported study, children who are on computers - or other electronic media, such as Nintendos and iPads – for more than four hours a day tended to be overweight, favouring screen time over time spent outdoors or pursuing other interests. In another study of 1,000 10-year-olds carried out by the University of Bristol, it was found that more than two hours a day of screen time – either telly or computer – could result in “psychological difficulties” in a child. And a third study found that children who spend a lot of time gaming – either on hand-held consoles or computers – risked tendonitis, depression, a fluctuation in moods and shoddy levels of school performance. Set ground rules early on. Don’t allow your child free reign when it comes to computers. Experts recommend not allowing primary school children to spend more than one hour a day on the computer, while some parents restrict computer time to the weekends. Resist the urge to use computers as babysitters. It’s all too easy after a hard day at work to allow the children unlimited access to computers and telly. But allowing them too much time in front of any screen will only worsen their behaviour, not give you the peace you crave. Find out what’s really going on with your child’s screen habits. If your child gravitates to the computer, then back to telly and then over to the iPad, it might be time to take a deeper look at their everyday activities – and change them. Use a timer – and make it fun. If you find yourself constantly bickering with your child about how much time he or she spends in front of the computer, get a timer. That way you – and your child - know exactly what’s going on. Don’t waste time squabbling – make a game of it. If all else fails, some parents find it easier to limit their children’s computer time with parental control software. Free Internet downloads are available, or you can buy customised software online. Most of these packages come with special features that allow parents to set personalised limits for each individual child, so you can set time limits according to your child’s age, personality etc. Additionally, they usually work on more than one computer, so you don’t have to pay extra for every computer in the home. Finally, many of these programmes also offer special passwords that allows parents to override the controls they set. That means if your child needs to work on a special homework project on the computer, they can work for as long as they need to. When used properly, computers can become an important educational tool for your children. Not only do educational computer games help children open up the world around them, but they also teach children technological skills that could be important for their future. Children who are allowed to indiscriminately use computers with little or no adult supervision, however, are doing themselves – and their parents – a disservice. Like everything, computer time should be limited, with moderation as the key. You know your child, and you know yourself. Having strict computer usage rules – such as limiting recreational computer time only to the weekend and banning computers from bedrooms – might cause outrage in your children. But in the long run, you are no doubt doing them an immense favour, one that will pay off both now and in the future.